This is Ireland, and this long grey inland chunk in the middle? This is County Cavan. Dixie the Backwards Van rolled into Cavan with little expectation really, just full tanks of both diesel and fresh water (and thankfully empty tanks of everything else), we were looking for a week off. A week off what, I hear you ask, and you’re right to ask, we have no jobs or commitments or appointments or none of the usual stresses that come along with houselife and now in our 13th month of living in the back of a Fiat Ducato we have gotten pretty good at relaxing. A week off the crowds of Dublin I suppose, the traffic, the noise, the constant comings and goings of a busy capital city. This time we wanted to explore somewhere new to both of us, somewhere NOT on the incredible Wild Atlantic Way coastal route. Somewhere unhighlighted, a place you never really hear about, somewhere laid back and wild… Cavan fit the bill perfectly. I reasoned there’s already A VAN in Cavan, why not make it two? Cavan is decidedly NOT grey like on that map and we came to the conclusion that for the weather or the season or whatever other reason, it is by far the greenest county we have visited yet. Its late September and autumn is asserting itself along the East coast in rough seas and record high winds, leaves were turning brown to fall in Dublin when we left yet here in Cavan the long square fields and rolling drumlins are rich and fertile. Down we drove through country lanes lined with lush summer foliage still spilling from the hedgerows. In Glangelvin you’ll find the pretty bridge above, it marks the start of the short walk to the Shannon Pot, legendary source of the famous River Shannon. Recently, a team of divers discovered the mighty river actually rises some 10km north of here in Northern Ireland but Cavan County Council have nonetheless set out a fantastic little stroll from the parking area to the pond via an accessible path. Expect illustrated information boards along the way telling the many mythological tales attached to the biggest river in Ireland (and the whole of the British Isles!) and its supposed rise at this quiet inland spot. The area is rich in spiritual history and has long been a site of religious significance. Walking there it’s easy to see why, a certain kind of peace floats in the air, the bubbling pond shaded by overhanging trees dipping their braches into the water, dancing their still-green leaves on the surface. We recommend you visit and see for yourself, we saved travel time in the morning by sleeping in the vast, empty carpark and awoke to sweeping views of many hills dressed in dewy cloaks of varying shades of green. Winter is coming. There, I said it. This will be our second vanlife winter. Those of us who live in vehicles can feel the subtle changes in weather more keenly, a routine door slam can alter the temperature inside dramatically and a crispy cold air arrives with the light through the back door every morning. Where once we sat warmly with our coffee, dangling our legs off the bed and watching the world wake up, now we huddle together, a fleece blanket draped around our shoulders. It won’t be long before the weather keeps the door shut tight altogether instead. 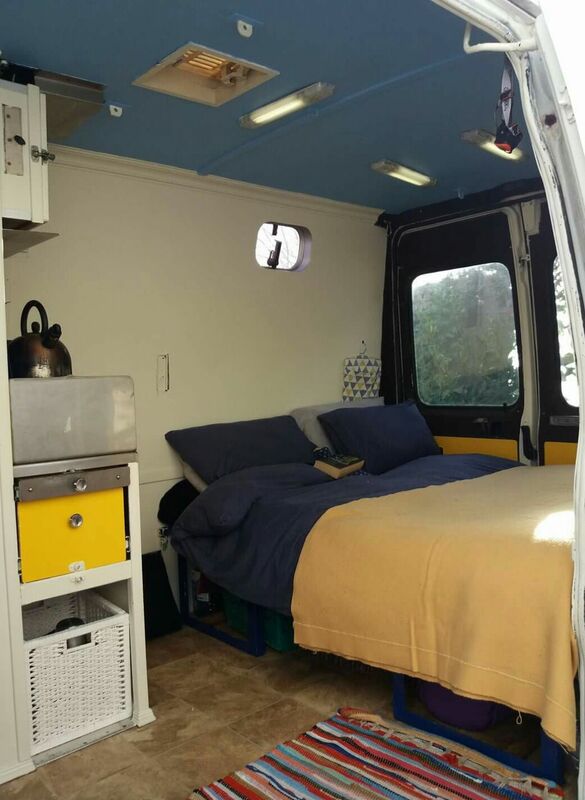 In motorhome forums and on Facebook pages, talk turned this week to winterising your vehicle, the many steps to ensure heat retention and the various devices available to warm the space and avoid the common weather-related pitfalls of vanlife such as frozen pipes and frozen water tanks. Planning for the inevitable icy temperatures and also the worst case scenarios starts early. As it is still only September (no matter how late in the month), here in the Backwards Van we’re trying to ease into winter by letting autumn happen first. Baby steps. Also, our heater is still broken, an inconvenient reality we really should face. But… we’ve been saying that all year. Usually we forget we even have a heater until it gets cold again and we’re forced to remember. Cavan is Ireland’s lough district and the locals here say if you fished a lough a day it would take a year to cover them all. Coming from the angry coast, every flat still pool was a welcome sight to us and most larger lakes have excellent viewing areas and picnic spots to pull over at. The fisherpeople are our friends as they require the same free facilities as us vanners, parking is essential with so much equipment and toilet blocks and taps are used gratefully. They wait patiently, thigh-deep in the dark water to catch their fish where we wait patiently, camera in hand, to catch the sunset. We stopped to stare (sometimes overnight) at some of Cavans numerous stunning puddles, Lough Sheelin is world-famous for wild brown trout and other species, as are Gowna, Ramor and Silian but Lough Oughter is really a sight to behold, we’ve been eyeing it on Google Maps for about a year now. All that trapped water, so many isolated little islands, inlets and coves to explore and we were finally driving the tiny, dead end, waterlogged roads we had studied so hard from above. Following a trail of brown signs emblazoned with white fish, we ambled down narrow, potholed roads only getting narrower and potholier until eventually the lane ended in a little lot by the lough and Dixie could rest her engine under an apple tree by the shore. Home for the night! After settling in and cooking dinner, the evening was still so warm (and the insects so few and uninterested for once) William propped the back doors open using Jock, his Scottish stick (don’t ask 😆) and we slept soundly with the breeze on our faces, listening to the lapping lough. Winter just seems so far away. Dawns light through the doors roused us earlier than usual and we took our coffee for a walk, into a little wood and out again to the pebbly shore of Lough Oughter. A couple of tents had popped up overnight on the bank opposite but it was so early not a soul was stirring, not even a bird bothered the morning silence. Around another corner the island fortress of Clough Oughter Castle appeared into view, the 400 year old stone stronghold floating on the still water like something from a fairytale. A local firm runs trips to the castle island via canoes and that exciting excursion now joins the list of Things We Must Do Soon. We found some flatish stones as table and chairs and sat sipping our coffee and watching the inky pink colours drip into the sky, remembering Dixies visit to the similarly magical Kisimul Castle on Barra Island in Scotland earlier this year. Our laughter must have disturbed the campers and we watched as one by one they emerged from under canvas, rubbed their eyes and shouted morning salutations over to us, our friendly greetings echoing back and forth across the shores. The short walk back to Dixie from the magical castle yielded plenty of foods to identify, discuss and cook up for dinner later. We foraged 6 different kinds of edible mushroom including ceps and poofballs and two bags of fat ripe blackberries are just out of shot! The most difficult cold weather challenge in Dixie is build-up of condensation. Ventilation is essential to keep a healthy circulation in the van but ensuring sufficient airflow to keep us both alive obviously means heat must be lost somewhere. We use the shower room vent which provides enough circulation (and minimal leaking) and we can keep the curtain wedged almost-closed as an anti-draught device. Last winter we had condensation appear daily on the ceiling, especially by the sliding door and the wood was rotting as a result. This summer we treated the whole interior to a coat or two of sealant and a couple of licks of paint so we’re excited to see if it makes any difference. There is nothing quite like waking from warm slumber to large cold drops of condensation hitting our faces, let’s try to avoid that particular discomfort this year. Cavans roads are all humps and bumps and long, languid lumps so when you take your camper here be sure to tie down your belongings! We didn’t, once, and all the things fell to the ground 😕 Lesson learned! We wandered aimlessly as usual throughout the entire county that week and found that around every corner is another beautiful lough to rest beside. This one photographed below is McNean, just outside Blacklion, another broad expanse of water complete with pretty sandy beach. None of the places we stopped at all week in Cavan bore any signage forbidding campervans or overnight parking, nor did we encounter a single parking metre and after noticing and researching this, we discovered the county council are quite happy to have mo-mads like us use the facilities and stay at any one place for a 24 hour period. Well done to Cavan, for providing us campers the wide open spaces, the well maintained toilet blocks and most of all the parking peace of mind! Undoubtedly one of our favourite sites visited this week was Cavans best tongue twister, Moneygashel Cashel. Just outside Swanlinbar, the early Christian site is a little unassuming to begin with. In the absense of allocated parking, Dixie was abandoned at the gate while we cautiously made our way up what looked to be somebodies driveway. A yapping, fearless little dog came out to greet us, baring his tiny teeth and snarling like the keeper of the gate but the barking soon stopped as he watched us pass him by and disappear up and over the hill. The cashel itself comes later as first, the trail led us through an authentic but creepy abandoned 1950s farmyard and the associated barns and buildings, also creepy and abandoned. Disused equipment lay around the yard and barn doors swung on their hinges as we snook around the premises like thieves, stealing only still images of the old deserted homestead, long lost in time. The thick farmhouse door opened easily to invite us in. Heavy wooden furniture suffocated under a thick layer of dirt and grime, a mound of smashed crockery littered the cold kitchen floor, the stench of mould filled the musty air. Up the creaky splintered staircase 2 old beds sat dressed in once white sheets, now rotting to yellow and an antiquated sewing machine gathered dust on the landing, waiting to one day be used again. In every room, thick scraps of coloured paper flaked from the walls, exposing a previously forgotten pattern to the daylight again. Boxes of books and papers sat decomposing under an old bureau and by the door, a faded sepia portrait of Pope Paul VI, hanging in a dusty glass frame. Leaving the farmhouse behind, the stony path beckoned us further up the hill to the ruins of the cashel. A cashel is a secure circular enclosure built to keep houses and animals contained and the site of Moneygashel, constructed sometime between 500 and 1000AD, boasts 3 seperate cashels and an underground souterrain alongside many other more ancient structures like a Neolithic dolmen and wedge tomb with a couple of stone circles scattered about the nearby fields for extra authenticity. We enjoyed a lovely walk around the sprawling stone mounds and ruins. The cashels walls are 3 metres thick in places and up to 4 metres tall, they were built to last and wandering in and out of ancient doorways and communal areas and pig pens we thought about how these settlers protected themselves against the elements with well-placed fire pits and very small entrances and doorways into each little house. Climbing the sturdy, moss covered steps we jumped the thick wall and traced the large circular pen from the outside. The signposted walk around Moneygashel Cashel takes about an hour but we spent around 3, climbing the walls and examining the solid stonework of the various structures from every angle. The fiesty canine gatekeep could not have cared less about us on the way back down, he knew by now we’d glimpsed the cashel and walked the ancient path, he had nothing left to protect. Now, those of you that follow our Facebook page will know we often pick and bag litter when we see it, when collection is doable, when the amount manageable and when bins are available nearby. We never leave the van without bin bags and we have met our fair share of horrendous carpark and beauty spot messes made by disrespectful humans. In County Cavan? From Blacklion to Bailieborough, from Belturbet to Ballyjamesduff, we saw not a scrap of litter anywhere. The hedges are neatly trimmed, the gardens colourfully planted and watered and locals clearly take pride in their beautiful loughs, quaint little towns and busy waterways. That is so refreshing. The jewel in Cavans crown is absolutely the newly restored Cavan Burren Park. Part of the massive UNESCO Geopark which spans this and County Fermanagh in Northern Ireland and chunks of the Iron Mountain Range, (making it the first international geopark ever) Cavan Burren Park is a huge swathe of boggy burren land brilliantly laid out into numerous signposted walks to suit visitors of all levels and abilities. Although a grey, misty day when we arrived, the threatened rain never really materialised and we spent another wonderfully warm afternoon wandering in Cavan carrying our raincoats. We were already excited at the gate to the park, before Dixie even made it up the drive. A sign sent us off road and on foot, through the woods in search of a dolmen. There, in the thick grass, signs of ancient stone circles and structures. Through the trees we spied a line of massive oddly shaped boulders obstructing the otherwise flat landscape, they are glacial erratics, dropped here by glaciers, just like those we found at Brimham Rocks. The park is huge, spread over hundreds of acres and the trails and pathways marked spread from the information building and carpark like little tentacles on the map. One took us down through a dark and humid forest valley where the grey cliff-face walls hide secret slimy wet caves to explore. Here the air smelled like a soggy jungle and vividly coloured mushrooms spurted forth from every mossy patch around. Another track pulled us up countless cute wooden steps to a wonderful but breezy hilltop view of the whole geopark and back down past the ruins of an ancient sweathouse and a very old church. Watch out for blue poles located along the way, they contain information boards which slide out to tell the history of the land you are walking on, highlighting the layers of stone exposed in the bog, the sink holes, the plants and animals found around these diverse habitats, the names and stories behind each boulder and each mound and pile of stones. Below is the Giants Grave, a large and well preserved portal tomb, resting for a millenia on this spot. The Burren Park is packed full of interesting sites to look around, the Calf House Dolmen, the Giants Leap, the Sunken Valley, an old lime kiln and a ruined promontory fort. A collection of erratics rest awkwardly in the boulder graveyard and around every turn more bright and dark and brilliant, neon greens bursting into view. Blown away by the diversity of animals and plants and rock and soil types in such a relatively small geographical area, the Cavan Burren Park was an amazing, easy and free day out! With our walk in the park coming to an end, we wandered off-path and between some tall trees to ensure we didn’t miss anything. It was much colder under the leafy canopy and we picked our way over roots and branches, stepping lightly on the odd green carpet below our feet. It transpired this odd green carpet was mainly leaves which quickly began to crumble and collapse beneath our boots the further into the forest we trekked. We stopped to reassess our direction as the path had long disappeared from sight and both of us immediately started sinking into the forest floor. I got a little frightened at this stage by the strange, bouncy terrain and tried to grab hold of a nearby tree but the dead wood turned to sawdust in my hand and the branch snapped under my weight… balancing on anything I could use as a stepping stone I danced out of that weird woodland and back to terra firma so fast I didn’t even wait for William! Another night, another beautiful sunset and another scenic waterside parkup. We follow the narrowest of roads to find the quietest of places and in this way, Cavan provided! We saw few people all week, the occasional dog and walker or fisherman greeted us as they passed by but really, the county is wide open and empty. A peace-seeking campervanners dream! While you are in Cavan, visit St Kilians well in Mullagh and then drop into the heritage centre where you can pay €3 each to watch a short, confusing movie about the life of the Saint (one of the main characters appears to eat himself in shame but this fact is glossed over and rather easily accepted). Stop in Keshcarrigan and walk through the cute little town before you realise you’re accidently in County Leitrim and leave. Similarily, as Cavan is a border county, when the icecream is priced in pounds and pence instead of euro you’ll know you’ve been blown slightly off course and into Fermanagh, Northern Ireland. Buy the icream anyway of course. Then roll down to Ballyconnell marina for a lovely and affordable veggie breakfast in Cafe Realta, while you are there pick up your supplies and purchase a Waterways Ireland card for anytime access to the bathrooms, shower block and even the waste disposal points dotted along the Shannon Erne canals. Go to the Bear Essentials workshop in Bawnboy, we did, to discuss a potential facelift surgery for my lifelong furry friend Mr Pugh (the hospital deserves it’s own blog entirely, we were welcomed warmly by the owner but maybe I’ll wait until after the procedure to review in detail 😉) Tullydermot Falls is right by the road, park up and watch the brown waters collect and pour down here from the slopes of the Cuilcagh Mountain. Take a walk in one of Cavans 4 forest parks, we traveresed 2 of them and found miles of thick native woodlands and more beautiful loughs. There is just so much to see and do. Hike up to Finn MacCools fingers, the 6 standing stones high up the Shantemon Mountain. Follow the path here too, we accidentally beat our own and I ended up with a face scraped up by thorny bushes and a pair of torn leggings, still I regret nothing and the sacred stone digits were worth the walk. Somebody up here is attracting bees and we were delighted to see and hear the little pollinators at work. The graveyard at Drumlane Abbey contains a wealth of interesting items such as a round tower that’s lost its pointy hat, delicately decorated doorways and intricate facial carvings weathered smooth by the passage of time. The tower also hides a secret carving of a cockerel about 8ft up the round wall, don’t leave Drumlane until you’ve found it! Took us almost 45 minutes and a couple of Google searches for clues. On our last night in Cavan, the weather forecast warned of a storm named Ali due to hit the country the next morning and as the various government bodies issued their colour coded warnings we made the decision to find a sheltered spot and wait it out. So much for easing into winter but at least it would present a chance to test the van against fierce wind which will only become more regular in the coming months. We found a little rocky beach on Lough Gowna, angled Dixie to face the sunrise and made sure to park far enough away from the big old oak trees which line Gownas shores. It was a beautiful pink sky autumn evening so William lit a campfire and we sat basking in its warm glow until well past bedtime. At dawn, all was calm, Lough Gowna untroubled by even a breeze. It wasn’t until 11am that the wind began to assert itself, slowly rustling the leaves nearby and working up into a noisy frenzy, by midday unpredictable bursts of gusts and gales came at us from all sides. Dixie shook and swayed and rocked on her rubbers and we hunkered down in the back, seizing the chance to climb back into our warm bed. Winds reached record speeds for an Irish September. Storm Ali took two lives that day, a Swiss tourist died tragically when her rented caravan blew off a headland in County Galway and a young man died in nearby Slieve Gullion when a tree fell on him as he worked clearing debris from the storm, both incidents happening in places we go to like cliffs and forests and to people just like us, a stark reminder that weather is hugely unpredictable and must be taken seriously at all costs. Dixies doors were battered by wind and rain for around 3 hours with no real draught blowing inside, proving the seals are capable and strong. No leaks, no weakness to report and future gale force gusts, with a little strategic parking, we know we can handle. Leaving Cavan that day after the storm the bright sun was high in the sky and we rolled the windows down and sang along to the radio. We knew we should be headed towards someone who can help us fix the heater but on such a nice day, surely it can wait? Previous postThe Backwards Van- 2018 Blog Awards Ireland Finalists! Glad you enjoyed your visit. I live near Killeshandra, so recognised those lanes and views! If you come back to the Canoe Centre some time, let me know and we’ll hike up Bruise Mountain where you can see 6 counties laid out before you. Cheers, Nigel. Thanks Liam, have a great time and look us up if you’re near the Belmullet Peninsula, we can show you a hundred amazing places to park and we’d be delighted to meet you and your crew! Well just back from first night in my camper parked up at Shannon Pot having read your blog. Fierce windy night, hence fierce noisy night … but the ice is broken now and there will be no stopping me!